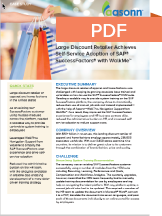 The large discount retailer of apparel and home fashions was challenged with keeping its growing associate base trained and up-to-date on how to use the SAP® SuccessFactors® HCM suite. Needing a scalable way to provide system training on the SAP SuccessFactors platform, the company chose to dramatically reduce their use of manual job aids and instead implemented—with the help of Aasonn—WalkThru Navigation Support from WalkMe™. As a result, they improved the SAP SuccessFactors experience for employees and HR business partners alike, reduced the administrative burden on HR, and increased self-service adoption to reduce support costs. With $30+ billion in revenues, this leading discount retailer of apparel and home fashions employs approximately 235,000 associates worldwide. With over 3,800 stores spanning nine countries, its mission is to deliver great value to its customers through the combination of brand, fashion, price and quality. The company was an existing SAP SuccessFactors customer successfully using a number of modules from the HCM suite including Recruiting, Learning, Performance and Goals, Compensation and Workforce Analytics. The quarterly upgrades, however, meant that the HRIS team frequently had to manually update training documentation for use by employees seeking help on navigating the talent platform. With any platform update, a manual job aid also had to be updated. This required a member of the HR team to update the document in Microsoft® Word®, convert it to a PDF, translate the document into seven languages, and post each of those documents individually to an online portal for access by employees. With the number of SAP SuccessFactors modules in use—and the amount of training documentation that needed to be kept updated for each module—this was no longer a scalable, efficient way for the HR team to train users on how to use the SAP SuccessFactors platform. The organization easily had thousands of documents that needed to be managed. Just for the performance management module, for example, the organization had over 50 written training documents due to multiple language requirements. As the organization experienced continued growth and an expanding retail footprint, the HR team needed a better way to train users on the SAP SuccessFactors platform, more effectively communicate updates and changes to the platform, and make employee self-service simple and attractive. In the world of enterprise software, user adoption suffers when end users are unsure of how to navigate. To eliminate this challenge and simplify the SAP SuccessFactors user experience, the retailer scaled back dramatically on the development and upkeep of manual job aids and instead implemented—with the help of Aasonn—WalkThru Navigation Support from WalkMe within the SuccessFactors platform. WalkMe enables step-by-step guidance within any SuccessFactors module, eliminating the need for the company’s HR team to create and update manual training documents in multiple languages. In the same way a GPS device gives turn-by-turn driving directions, WalkMe guides users each step of the way to successfully complete their online tasks within the SAP SuccessFactors platform. With Aasonn’s strategic guidance, the company determined which SAP SuccessFactors modules and associated help topics would be most impactful to develop WalkMe tutorials around, based on the organization’s specific challenges and objectives. Once the approach was decided on, Aasonn then helped the company execute on that vision, developing the content for the WalkMe tutorials and making it available across all seven languages. Aside from improving scalability of the organization’s SAP SuccessFactors training efforts, WalkMe also supports the company’s ability to more rapidly disseminate relevant, targeted content to employees. If there are updates the HR team wants to make end users aware of within the SuccessFactors platform, they can easily utilize pop-up notifications that are made visible to users upon logging into the system. With WalkMe, the company can now also select the specific audience that should have access to each WalkMe tutorial. Employees only have access to tutorials that are relevant based on the permissions and modules assigned to them—something that was not nearly as easy to do with the written job aids. This functionality enables the organization to deliver targeted messaging to employees, improving communication effectiveness and employees’ overall experience with the SAP SuccessFactors platform. 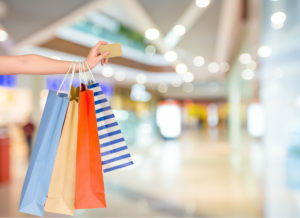 With the intuitive, user-friendly navigation support afforded by WalkMe, the retailer has been able to drive user adoption of the SAP SuccessFactors platform by making self-service simple and attractive. By reducing the complexity for end users, the HR team has also been able to reduce associated support costs and increase workforce productivity. Implementing WalkMe in the SAP SuccessFactors platform has dramatically reduced the administrative burden on the company’s HR team in two ways. First, since they no longer have to create written job aids to support their SAP SuccessFactors training efforts, the HR team has freed themselves of a number of time-consuming manual HR processes. Second, by driving self-service adoption of the SAP SuccessFactors platform, the reduction in hands-on system training support required has enabled the HR team to use their training resources on more strategic, value-added tasks. The detailed analytics available in WalkMe also provide valuable insights regarding the overall effectiveness of—and areas for improvement within—the organization’s training efforts. Since implementing WalkMe, the company can now easily view overall usage and what events—such as new hire onboarding or performance review cycles—tend to cause usage surges. The HR team can also drill into the details to learn more about each specific WalkMe tutorial and determine if any modifications are needed to the content based on where users tend to drop off. WalkMe also keeps track of the search terms entered by users—and the results of those searches. Searches resulting in an action typically means the user found what they were looking for, while no action means it might make sense for the HR team to add keywords to existing WalkMe tutorials or perhaps even build a new tutorial to meet user demand.